T-2 toxin is a mycotoxin of the group of trichothecenes produced by fungi of the Fusarium genus i.e Fusarium acuminatum, Fusarium poae, Fusarium sporotrichioides and Stachybotrys chartarum commonly found in various cereal crops (wheat, corn, barley, oats, rye etc.) but also in soy meal. 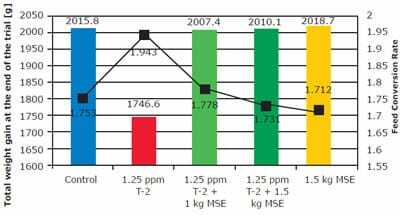 Trichothecenes are in general very stable compounds, both during storage/milling and processing of feed and they do not degrade at high temperatures (pelletizing, extruding). They interfere with the protein production, thus damaging any process depending on protein synthesis such as growth and reproduction. Their negative impact on the immune system is also already proven. Additionally, T-2 toxin and diacetoxiscirpenol (DAS) are strong dermatotoxins which cause lesions and necrosis of skin and tissues. The aim of the trial was to evaluate the effect of 1.25 ppm T-2 toxin on performance and health of growing male broiler chickens. Additionally, the efficacy of 1 and 1.5 kg of Mycofix® Select to counteract T-2 toxin was tested. The trial was made in the experimental units of the International Institute of Animal Investigation (iiia) in Queretaro, Mexico, under the surveillance of Dr. Miguel Forat. Ninety Ross 308 male broilers were weighed and randomly assigned to 6 groups, 1 bird per cage and 18 birds per group (Picture 1). The trial started at day 10 of age and lasted until day 39 of age of the birds. Prior to start, birds were fed a pre-starter diet, and during the trial a grower diet based on corn, soya paste and soy oil meeting the NRC requirements, with a crude protein of 20% and providing 3000 kcal. Feed was provided as mashed feed. A 23/1h light/dark cycle was chosen. Raw materials used for the diets were free of mycotoxins. Respective mycotoxin diets were contaminated using T-2 toxin culture material provided by Biopure®. The detailed trial set-up can be taken from Table 1. 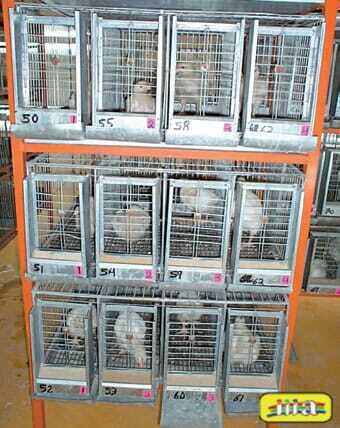 Broilers were weighed at the beginning (day 10 of age) and at the end (day 39 of age) of the experiment. Feed consumption was determined at the end of the experiment. Lesions were determined and classified according to a lesion score at the end of the experiment. Quality of feces (normal, diarrhea and bloody) and feathers (normal, dorsal region, feathers of the tail), as well as behavioral changes (caquexia and emaciation) were revised on a daily basis throughout the experiment. Accumulated mortality was calculated at the end of the experiment. Picture 1. Installations of the trial. Results of performance can be taken from Table 2 and Figure 1. Results were compared using ANOVA and means were compared using Duncans´ multiple comparison test. Statistically significant differences are indicated by different superscript letters. There was a significant difference in weight at day 39, total and daily weight gain, feed consumption and feed conversion rate between groups 1 and 2 confirming the negative impact of 1.25 ppm of T-2 toxin on performance. This negative impact was completely overcome in both groups where Mycofix® Select (1 and 1.5 kg per ton of feed) was added. Table 2. Weight on day 39, feed consumption, weight gain and feed conversion rate of broilers fed with diets contaminated with T-2 toxin and treated with Mycofix® Select. a,b,c Different superscripts indicate statistically significant differences. Figure 1. Total weight gain (calculated as difference in weight [g] between weight day 10 and weight day 39) and feed conversion rate over trial period (black line). Figure 2. Number of birds (in %) with lesions on day 39. Picture 2. Buccal cavity of a healthy bird – no visible lesions. Picture center and right - Buccal cavity of a bird with lesion score 3 – lesions with white-yellow plaques, lesions with necrotic points. Results of the evaluation of lesions are shown in Table 3. Table 3. Occurrence and type of lesions observed in male broiler on day 39 in % and severity of lesions in numbers following the described scheme. As can be taken from Table 3, T-2 toxin caused severe lesions in 94% of the birds (group 2). 87% of the lesions were ulcers with an average grade 1.85, meaning lesions with white-yellow plaques and 80% of the ulcers were with crusts see Picture 2 (center and right picture). Feces and feathers were considered normal. No nervous abnormities were observed during the trial. Lesions observed in groups 3 and 4 were only present in 12% of the birds. No ulcers and also no ulcers with crusts were observed in none of the groups treated with 1 and 1.5 kg/t of Mycofix® Select (groups 3 and 4, Picture 2, left). 11.11% of the birds in group 2 died whereas in all other groups no mortality appeared. T-2 toxin causes severe buccal lesions and decreased performance (feed conversion and weight gain) in male broilers. Mycofix® Select at both tested inclusion rates (1 and 1.5 kg/t) could completely overcome the negative impact of 1.25 ppm T-2 toxin on male broilers. There was no difference between the two tested dosages counteracting T-2 toxin. Therefore it was proven that also a relatively low dosage of Mycofix® Select can prevent and counteract a high impact of T-2 toxin in birds.